Delicious, Premium And Always 100% Arabica. Texas Coffee Co's Seaport Coffee. 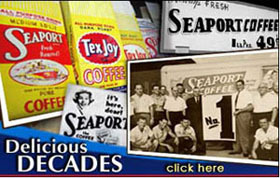 03.07.11 - Seaport Coffee is pleased to announce a new package soon to hit store shelves. The new coffee bag is Seaport's "Fresh Valve Pack," sealed with a small valve on the front of the package to eliminate excess air and to lock in freshness. This valve pack allows for a more modern, slimmer looking bag on the shelf, but more importantly it allows for Seaport's coffee to be fresh-roasted, ground and packed daily, ensuring an extra quality of freshness for every bag. Learn more here for the official release. 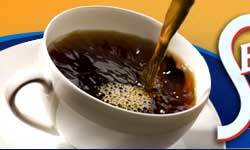 Try our popular mild roast coffee Founder’s Choice -- a delicious, full-bodied taste and a smooth finish. 100% Arabica coffee. ‘The Roast of the Gulf Coast’ is a favorite from Southeast Texas to all across the United States . Also, try our Southern-style iced tea. Shop online or at these retailers.